VANCOUVER, CANADA – Kaizen Discovery Inc. (TSXV: KZD) announced today that its subsidiary, Kaizen Discovery Peru, has signed all land access agreements with the community of Pinaya and individual private landholders. These agreements provide the company with access rights to conduct its planned exploration program at the Pinaya Project for a two-year period. Kaizen also signed two separate agreements with the community outlining social development and employment commitments. In addition, Kaizen received its water-use authorization for the Pinaya exploration camp on November 2, 2016. In conjunction with the granting of access rights, Kaizen now has satisfied all necessary requirements to trigger ITOCHU Corporation's second-stage investment of C$625,000 in the project. Upon receipt of ITOCHU's investment, ITOCHU's interest in Kaizen Peru Holdings – the indirect holder of the Pinaya Project – will increase from 5% to 10%. Kaizen plans to commence fieldwork at Pinaya this month with an initial exploration program including re-logging of existing drill core, a detailed mapping program and regional-scale stream sampling of areas where no previous, systematic exploration was carried out. Eric Finlayson, Kaizen's Interim Chief Executive Officer, stated, "We are pleased to have reached an agreement with the community of Pinaya, which allows us to conduct our exploration and development activities for the next two years, while also providing a framework through which the community can benefit from our activities." Under the terms of the strategic financing agreement between Kaizen and ITOCHU for the Pinaya Project, which were outlined in Kaizen's April 1, 2016 news release, ITOCHU's third payment of C$1.25 million, to bring ITOCHU's aggregate interest in Kaizen Peru Holdings to 20%, is conditional on Kaizen obtaining the necessary environmental, archaeological and water authorizations required to conduct exploration drilling on the Pinaya Project. In this regard, Kaizen filed the Pinaya Declaration of Environmental Impact (DIA) application on October 11, 2016. Upon approval of the DIA, related permits and authorization to initiate activities, Kaizen will have met the requirements for the third installment of the ITOCHU investment. Kaizen has agreed to match ITOCHU's exploration funding for the Pinaya Project, bringing the total funding to C$5 million for the planned first phase of exploration at Pinaya. The initial C$1.25 million of Kaizen's C$2.5 million funding is due on or before the earlier of (i) April 18, 2017, one year after the date of ITOCHU's initial C$625,000 investment; or (ii) completion of ITOCHU's third-tranche payment. Kaizen's second C$1.25 million is due on or before April 18, 2018, two years after the date of completion of ITOCHU's initial C$625,000 investment. 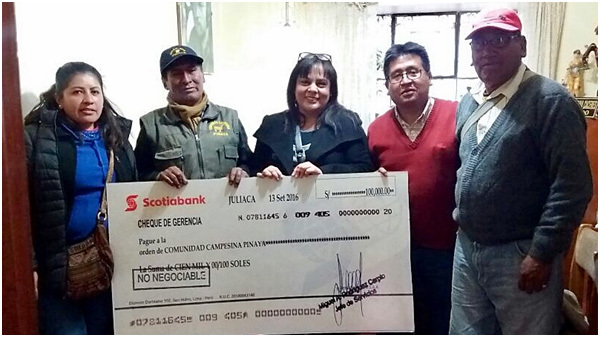 Katty Vargas (center), Kaizen Discovery Peru's General Manager, with representatives of the Pinaya community at the land access agreement signing ceremony.